Can the US accept allies as equals? 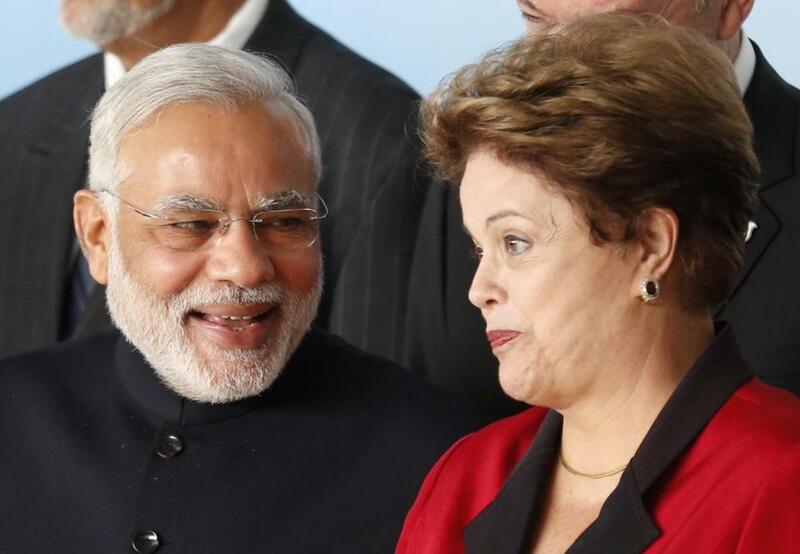 India’s Prime Minister Narendra Modi (left) talked to Brazil’s President Dilma Rousseff during a summit in Brasilia Wednesday. Taking this episode as simply a misunderstanding over privacy issues, however, would be to miss its larger importance: It also suggests that the United States is having trouble adjusting to a new age of more equal global partnerships. Especially during the Cold War, the United States had the power to intimidate countries that we euphemistically called “partners” or “allies.” Sometimes we forced them to take steps that were against their own interests. Our relative power in the world has declined, but many Americans still find it jarring to make political and diplomatic compromises to accommodate our friends. We expect other countries to accept our worldview and defer to our agenda, not the other way around. This leaves us unable to adapt to the changing nature of alliances. Troubling breaches have opened between the United States and the most important country in Europe, the most important country in Latin America, and the most important country in South Asia. All three — Germany, Brazil, and India — still want to remain friends with the United States, but only if the US changes its behavior. Many Germans have been alienated by aggressive American policies in the Middle East and beyond. The recent surveillance scandal further strains the German-American alliance, which grew as a response to specific conditions — World War II and the Cold War — that have receded into history. Germany feels a natural pull back to its traditional Central European identity. To keep Germany as a close partner, we must take its concerns seriously. There is no sign we are prepared to do that. Brazil, another valuable partner, is also unhappy with American behavior. Brazilian leaders strongly oppose key US policies in Latin America, including our embargo on Cuba, our tolerance of the 2009 military coup in Honduras, and our relentless campaign against the leftist regime in Venezuela. They would like us to take their views into account when shaping policies for their region. Many in Washington find such expectations ludicrous. After it was revealed last year that the United States was spying on President Dilma Rousseff of Brazil and members of her government, she expressed her “personal indignation and that of my country” and indefinitely postponed a state visit to Washington. American presidents have occasionally canceled trips to make a point, but rarely if ever have we been on the receiving end of such a snub. Our relations with India are also troubled. We held India at arm’s length during the Cold War because it sought to maintain good ties with Moscow. More recently, we have pressured it to end its friendship with Iran, which extends back thousands of years. Indians are deeply unhappy at the way the United States has rampaged across nearby Afghanistan for the last decade. Recently they have learned that their leaders, like those of Germany and Brazil, have been targets of US surveillance. President Obama once said the US and India could form “a defining partnership of the 21st century.” That is only possible if we accept a partnership we do not dominate.